We’d love your help. 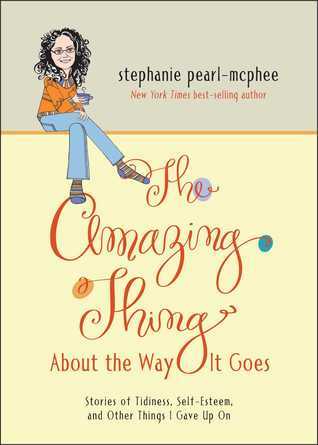 Let us know what’s wrong with this preview of The Amazing Thing About the Way It Goes by Stephanie Pearl-McPhee. From New York Times best-selling author and popular blogger Stephanie Pearl-McPhee comes a new spin and a hilarious look at life, parenting, and, well, pants. The Amazing Thing About the Way It Goes takes on the amazing in the ordinary in this side-splitting series of short commentaries. Pearl-McPhee turns her trademark wit and perspective to everything from creative discip From New York Times best-selling author and popular blogger Stephanie Pearl-McPhee comes a new spin and a hilarious look at life, parenting, and, well, pants. To ask other readers questions about The Amazing Thing About the Way It Goes, please sign up. And with this book, Stephanie Pearl-McPhee officially becomes my spirit animal. It's not just the love of knitting. And Battlestar Galactica. And the three kids. And having a wonderful husband who nevertheless cannot see that the house is dirty. It's about the humor and pathos with which she describes motherhood. Personhood. It's about thinking that dodgeball was invented by a sadistic gym teacher. It's about applauding a mom at the grocery store whose three children are screaming and whose toddl And with this book, Stephanie Pearl-McPhee officially becomes my spirit animal. It's about the humor and pathos with which she describes motherhood. Personhood. It's about thinking that dodgeball was invented by a sadistic gym teacher. It's about applauding a mom at the grocery store whose three children are screaming and whose toddler is trying to pull down the mom's pants in an act of rebellion, and thinking, I've been there, it's horrible, but you can do this. It's about obsessing over a remark some jerk yelled out of car thirty years ago. Still very much one of SPM's books, though not as much about knitting as the others. I enjoyed it most of the time. Sometimes I wonder if there's anything else. It's not substantially different from the others, which is to say that I wonder how many memoirs a person can write before it's actually narcissism. And there's something bothersome about being continually reminded by someone who makes a living writing and knitting and teaching knitting that she herself isn't really all that special. If Still very much one of SPM's books, though not as much about knitting as the others. I enjoyed it most of the time. Sometimes I wonder if there's anything else. It's not substantially different from the others, which is to say that I wonder how many memoirs a person can write before it's actually narcissism. And there's something bothersome about being continually reminded by someone who makes a living writing and knitting and teaching knitting that she herself isn't really all that special. If she isn't, then there's no reason other people--namely myself--shouldn't be able to do it. So that particular thing about it reads as false modesty. While this one didn't have as much knitting content, I can admit she's covered that a lot and we luckily have her blog posts for that. It had it's literal laugh out loud moments for me (scared my family a time or two) and it's thought provoking and touching times as well. There was only one chapter (the email one) that I had to skip through because while I could see it working in her head, it just slogged on and didn't grab me. My only issue is the repetitiveness. I feel like I'm reading a sligh While this one didn't have as much knitting content, I can admit she's covered that a lot and we luckily have her blog posts for that. It had it's literal laugh out loud moments for me (scared my family a time or two) and it's thought provoking and touching times as well. There was only one chapter (the email one) that I had to skip through because while I could see it working in her head, it just slogged on and didn't grab me. My only issue is the repetitiveness. I feel like I'm reading a slightly modified version of the same stories from book to book at times (not ALL the essays, just a few). I wish she had a list and would cross off certain subjects and say "I already covered that...a few times". It wasn't as pervasive this time, but I still had a few moments of "darn, I've read this (or very similar) before". I swear I am getting crankier by the day. I love the yarn harlot, but I only liked this set of essays. 3.5 stars for a woman I genuinely appreciate and like, though I do not know her personally. The details: True there are a couple of poignant moments, and yes I did laugh out loud a few times, at 4am, which is when I usually read light as air stuff, all the while begging the cat to be quiet & leave me alone, hoping against hope for a few more winks. I like the harlot's husband, and her kids, I swear I am getting crankier by the day. I love the yarn harlot, but I only liked this set of essays. 3.5 stars for a woman I genuinely appreciate and like, though I do not know her personally. The details: True there are a couple of poignant moments, and yes I did laugh out loud a few times, at 4am, which is when I usually read light as air stuff, all the while begging the cat to be quiet & leave me alone, hoping against hope for a few more winks. I like the harlot's husband, and her kids, and the fact that SHE likes them so much. But as I read this book, I thought I could read between the lines to see her work-process, and that slogged a bit. I had the sensation of urgency, like the deadline for the book demanded she finish NOW, so the work sits a bit less polished than usual. And I missed the usually heavier percentage of knitting content. Her discussions about her looks and coming to terms with her looks left me feeling like I had too much information and not enough resolution to ease that feeling. I know Stephanie is a bright, creative, genuinely lovely person, no buts about it. I have benefitted myself from her wisdom and humor on a number of (funny) topics. This time, though, I wanted to thank her for her work, and apologize for being among the audience who would take her away from her family on a holiday. I remembered how hard it can be to work when the work is too much, or not fun or creative. Or not my own idea. She did not "lose the room" as she called it in one of the last essays, but Somehow I found myself wanting to look away, as though privy to information but without permission to comment. That lack of meeting of the minds made me cranky and looking for a way out. If I could comment, I would say to Ms. Pearl-McPhee that I wanted to pour her a cuppa tea and give her a kitten to pet. Wonderful, down to earth stories. Great writing. I felt like I was chatting with a good friend the whole time. It's the best kind of book, you laugh a lot, learn something, and feel lifted up and warm hearted after reading it. You'll want to buy extra to give to your friends. I guess if you are a follower of Ms.Mc Phee this would be the book for you. I only found two stories I liked, one was laugh out loud funny and the other was lovely. Except for these two it was a major snooze fest. I have enjoyed her previous books but this one just didn't click with me. Didn't finish a few of the stories that didn't hold my interest. I really did not like this one. Couldn't really relate much to the writer and was expecting something much funnier. I should probably face the fact that, as much as I enjoy humourous, autobiographical essays, I appreciate other forms of writing so much more. Actually, I should realize that the best way for me to digest these journals is one at a time with breaks, as I read the authors blog. But I have this need to quickly finish books that I start—to my detriment, because this is funny and touching stuff. So, I'll keep reading the Yarn Harlot's blog, and support her work by buying her books. What else would I I should probably face the fact that, as much as I enjoy humourous, autobiographical essays, I appreciate other forms of writing so much more. Actually, I should realize that the best way for me to digest these journals is one at a time with breaks, as I read the authors blog. Not as funny as her books usually are. I only laughed out loud in the first couple of chapters, the rest gained a smile at best. This book is primarily about parenting and how much cooler she thinks her sister is. I was glad to have borrowed the book from the library rather than paying for it. I generally like the author's style, but this book felt flat- many of the essays felt/read like filler, so that there was enough content to call it a book. Loved this. A funny and thoughtful read. This is a book of humorous essays - just light reading. The author has a blog, which is mostly about knitting but also about her life. Her other books have all been stories about knitting with a lot of humor involved. This one had no knitting at all. She is a good writer, but i did like her other books better. Fun. Our beloved Yarn Harlot has this way of writing that feels so intimate. This was less a book of essays, and more a catch-up with my friend Steph. Who I have met. And with whom I have a picture. In which I am wearing a sweater I knitted...Kind of like wearing the t-shirt of the band you're going to see. But I rocked it. So does she. Humorous essays about everyday life. I always enjoy Stephanie Pearl-McPhee's writing, and this book is no exception. I do miss her knitting-related musings, however, so this book was less interesting to me. Another great collection of essays by Stephanie. This is the first of her books that is not directed at knitters, and as such is more accessible. While I love Stephanie and her writing, I have to say that this book is not funny - rather, it's heart-warming and poignant. Highly recommended. I love Stephanie's books about knitting and it turns out I love her books not about knitting too. I think it's because she makes me feel normal, not neurotic and harassed like I usually feel! You don't have to be a knitter to read this book, you just have to be a person. I could not get into this book. I vastly prefer Peal-McPhee's knitting stories and am looking forward to her next anthology. I love reading these essays. They make me laugh, make me cry, and always make an impression on me. But wait....she doesn't like pie? I have loved the Yarn Harlot's blog for years and think she is incredibly smart and funny about not just knitting but life in general. And yet when I read one of her knitting books a few years ago, it fell flat for me. It's not that I didn't enjoy it, but it honestly wasn't as clever and funny as what I expected and so I haven't rushed out to read any more of her books. Then recently I was at a fiber fest and saw she was signing books and really wanted to get her to sign one for my mom. And so I I have loved the Yarn Harlot's blog for years and think she is incredibly smart and funny about not just knitting but life in general. And yet when I read one of her knitting books a few years ago, it fell flat for me. It's not that I didn't enjoy it, but it honestly wasn't as clever and funny as what I expected and so I haven't rushed out to read any more of her books. Then recently I was at a fiber fest and saw she was signing books and really wanted to get her to sign one for my mom. And so I grabbed this one. I almost mailed it out to my mom and then I decided that I should read it first. I'm incredibly glad I did. It's smart and it's funny. The skunk story had me laughing so hard I was crying and it has been a long time since a book made me do that. But I think why I rated this so high was that I got a glimpse into her insecurities and how she battles them day to day. She's incredibly popular and she shares a lot of her life online, but this book felt more personal and more daring. I admire that she shared what she did. And for someone who has similar struggles with insecurities and self-esteem, the book offered me insight into how to handle those struggles with grace and charm. I will send this copy to my mom but I think I'll be purchasing my own copy to reference time and time again. I didn't enjoy this one nearly as much as I did the other two of her books that I've read. I think it was because there was almost no knitting here. The essays are about life, and knitting is briefly mentioned but never the main focus of the humor. So I just wasn't feeling it. Some of the essays near the end were pretty good, and Stephanie Pearl-McPhee is a good storyteller, but overall it wasn't what I was expecting. Not as great as the knitting essay books, but a good one all the same. I started once months ago, but I was disappointed to notice that this is not knitlit. It took a while to get into it, but it was still Yarn Harlot. Just with much less knitting. Love Stephanie. We see her every year at Madrona Fiber Festival and she is a great master of ceremonies for the teachers talent show. I can specifically relate to the "oh if I just had time to knit" comment. DNF. I read the first several essays, didn't laugh, and decided to move on with life. It's a perfectly fine book; I'm either not the right audience or didn't pick it up at the right time. Hence, three stars. Stephen's books are wonderful. She tells it like it is and adds humor to her words. Waiting for another book from her. I have them all. Stephanie Pearl-McPhee (better known as the Yarn Harlot) is a prolific knitter, writer and blogger known for her humorous but always insightful anecdotes and stories about knitting triumphs and tragedies.